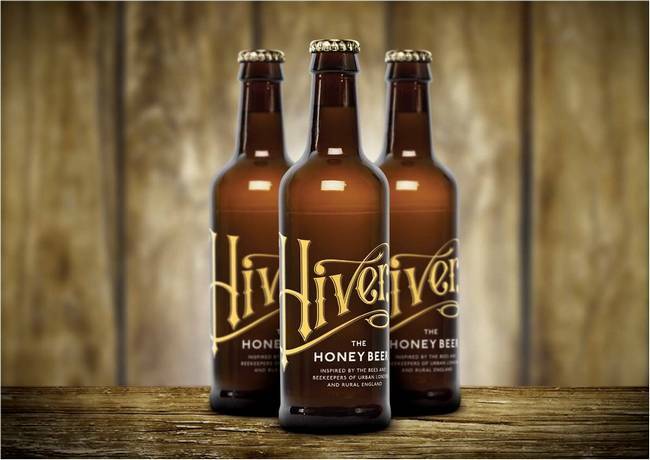 A new craft honey beer has arrived in the UK on trade. Hiver – The Honey Beer brand belongs to Hannah Rhodes, former sales and marketing manager for Meantime Brewery (Hannah was instrumental in the launch of London Lager) and, latterly, London sales manager for Frobishers Juices. While attending a workshop about urban beekeeping last year, Hannah developed a keen interest in bees and thus emerged the idea to showcase the story of independent beekeepers and their produce through a craft beer – her other passion. Smooth and easy-drinking, Hiver is an all-British, all-natural speciality beer, which is long-matured and unpasteurised. The blonde beer is fermented and conditioned with three different honeys and the subtle flavours are supported by a speciality organic malt. Bees forage in a three mile radius meaning that honey from independent beekeepers is varied in flavour, colour and aroma. The bitterness is low and UK cascade hops provide a light citrus balance to the beer. Hannah wanted to showcase the story of the urban and rural beekeepers and developed a recipe that ensured the honey flavour could shine through without it being too sweet or cloying. It was important to Hannah that the beer be of the highest quality and contain only British ingredients. 10% of profits are to be donated to pollinator charities and urban space development projects and the brand will focus on beekeeping imagery as it develops. “The time is right for a brand-led, well distributed craft beer that taps into the urban food scene. As a non-hoppy beer, Hiver is a refreshing change from the heavily hopped craft beers of late and provides bartenders with an authentic craft beer, a unique story and flavour profile and a beer that’s accessible to more mainstream tastes. Through a series of focus groups, I took on board the potential concerns of operators and consumers and I hope that the end result meets the demands of both. Hiver’s ‘soft’ launch sees it available in ten outlets across London with a number of tastings and events in the diary. The occasion was marked with a small, informal celebration for family and friends at The Hide Bar in Bermondsey Street, the very same venue where Hannah’s interest and subsequent career in beer first began, following a tasting event she attended there in 2007. Hannah intends to focus on independents and small multiples in the on trade initially. Longer term plans include a full trade launch and widespread consumer awareness campaign in early 2014. Two additional flavours are also planned. It was important to Hannah to work with a partner capable of providing a scalable craft brewing solution and, as such, brewing is carried out by 2012 Craft Brewer of the Year Hepworth Brewery in Horsham, Sussex. Distribution is provided by premium national wholesaler Liberty Wines, which is listing a craft beer for the first time, as well as via direct delivery. New distributors will follow soon. Hiver is perfect for craft beer bars, restaurants and festivals and it matches fantastically well with food. Premium outlets and sites with a food or ‘British-made’ focus will find it’s a great addition to their beer menu. With an ABV of 5% and striking screen printed bottles, Hiver is available for the trade in cases of 24 x 330ml with an RRP of £4.80. It is suitable for vegetarians.